The survey further revealed that millennials – also known as Generation Y – in mainland China are keener to invest in property too. Yet, as demand for real estate continue to grow amidst housing prices that continue to remain sky high despite stringent cooling measures, even Chinese millennials are beginning to find buying property in China becoming a herculean task. This creates a huge demand for new, well-appointed properties built to modern standards, a demand echoed by a fast-burgeoning Chinese middle-class population who desire to upgrade to better, modern housing as they become increasingly discerning in their property requirements. China’s financial sector has lagged behind the US, UK, and Europe for many years, and that meant a limited range of choices for Chinese investors. As such, unlike in the West where investors are offered an array of options to invest in, China offers little economically viable options for Chinese to store their excess wealth. After the property market was privatised in 19976, though, real estate became a popular channel for Chinese investors to cash in on macro trends, such as the rapid urbanisation and growth of the middle-class in China. Beyond the fact that real estate is one of the few viable options for Chinese to invest in, property is also considered a safer bet by Chinese to park their excess cash into, given the volatility of the domestic stock market. Besides that, China’s strong economic performance and booming housing market in recent years has also fuelled the general belief in most Chinese that property prices have only one way to go, and that’s up. That said, property will always be something of value to Chinese, as it’s something concrete that they could hold on to and live in, even if the economy were to crash. So, it’s easy to see why property is viewed as a safe and resilient asset, and why it has become the most preferred investment choice for most Chinese who tend to be risk-averse and prefer playing it safe. To accomplish that, Chinese authorities plan to help 100 million rural migrant workers obtain an urban hukou – household registration permits – and settle down in cities11 over the next three years. This excessive deluge of suitors means fierce competition in the mainland marriage market, where a Chinese man is expected to own at least one property before they should even embark on their search for a wife. It’s to the point that owning a home is crucial (practically a prerequisite, in fact) for marriage in China, which is why young Chinese men and their families will do all they can to buy property to make them more marketable in the marriage market, thus fuelling the heavy demand for real estate in China. Face matters in China, and we’re not merely referring to appearance and looks. In a society so conscious of reputation and hierarchy, Chinese place heavy importance on ‘having face’, and what better way to do that than buy a magnificent home to show off their wealth and investment acumen in front of family and friends? By just owning property, a person’s social status can be automatically elevated in mainland China because as clichéd as it may sound, those owning property is usually deemed more successful in the eyes of others in China, where the aspiration of being a homeowner has become ubiquitous. Needless to say, owning international property in other countries would further gain face and prestige for them, which could partly explain the Chinese penchant for buying real estate abroad. However, China’s property bubble has already made housing prices surge to record levels, prompting various cooling measures and property restrictions by the Chinese authorities. This means for many Chinese, their dream of buying a home in one of China’s fast-growing cities is looking further and further away. With real estate in China increasingly unaffordable, China’s fast-growing middle-class and upper-middle-class buyers are increasingly expanding their horizons by looking abroad for better property options. Already, international property is the most popular choice of overseas investment for Chinese high net worth individuals (HWNIs)9, as overseas real estate not only offer more value for money but also a shot at life overseas, thanks to enticing golden visas and relaxed visa policies in some countries. Chinese strongly believe in generational investments, and property is a safe and lasting asset to pass down for generations to come, particularly if it’s a legacy home abroad with freehold ownership rights. Additionally, although some of wealthy Chinese are increasingly in pursuit of independence after retirement, preferring to retire to their own homes to lessen the burden on their children, many Chinese still adhere to the Confucian ethic of filial piety, whereby Chinese children take care of their elderly parents when they are unable to care for themselves. 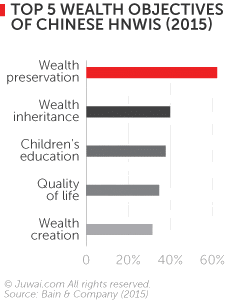 These two reasons greatly motivates Chinese parents to typically help their children invest in property, especially when they marry, thus making the home the bedrock of the family. Thanks to the above drivers, real estate has delivered huge returns to canny Chinese investors in recent years. For example, home prices in Beijing have risen from an estimated ¥8,400 ($1,246) per sq m in 2006 to an astonishing ¥52,104 ($7,733) per sqm by the end of September 2016, meaning that an investor in an 80 sq.m. property would have realised a net value appreciation of approximately $520,000 during that time period. China’s red-hot domestic property market has led to the Chinese government regularly bringing in restrictions on domestic real estate, especially in recent years. While this may cool prices, it bottles up demand for property, which will either head overseas or wait until the curbs lift and open up the home market again. And as the saying goes, people tend to want what they can’t have, and this applies to Chinese aspiring homebuyers. It’s factors like these that will continue to buoy rampant demand from Chinese investors for property both home and abroad, and the potential is staggering. Between 2017 and 2020, Chinese buyers are projected to invest in 4 billion sqm of property in the domestic market alone, according to China-based research firm CICC. With China’s private wealth predicted to hit 188 trillion yuan ($27.6 trillion) this year21, and with 94% of Chinese millennials intending to purchase property in the following five years1, we expect the Chinese real estate investment to stay strong.